Gold Ball (45-65 days) This old English heirloom vareity has round yellow roots with a spicy flavor. Stores well. Purple Top White Globe (60 days) White smooth round roots with sweet and mild purple and white flesh. Best used for root production. Seven Top (45 days) Grown for its dark green leaves. Root is inedible. Shogoin (45 days) Variety grown primarily for greens, though roots are edible as well. Light green tops are long and make excellent greens. White Egg (50 days) White roots are egg shaped, 3-4 inch in diameter. Very sweet and tender. 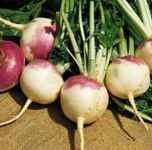 There is great diversity in the turnip varieties that we offer; which makes the general information provided only valuable as adjustable guidelines. This may also affect your seed planting and propagation strategies and the germination rates under your planting conditions may vary from the seed lot test results. The following soil temperature data is for turnips in general. Temperatures are average daytime from planting to emergence. Percentage is average germination rate. Days is number of days to emergence.